My dad, who remembers meeting Giuseppe when dating my mom, refers to him as “Papa Joe” in the affectionate way you talk about someone who was someone worth knowing. I have to guess at what Guiseppe was like because I don’t actually know too much about him or any of my Bombino relatives. In fact, until recently, I didn’t even know I had Bombino relatives. He then headed south to America and ended up in New Jersey. 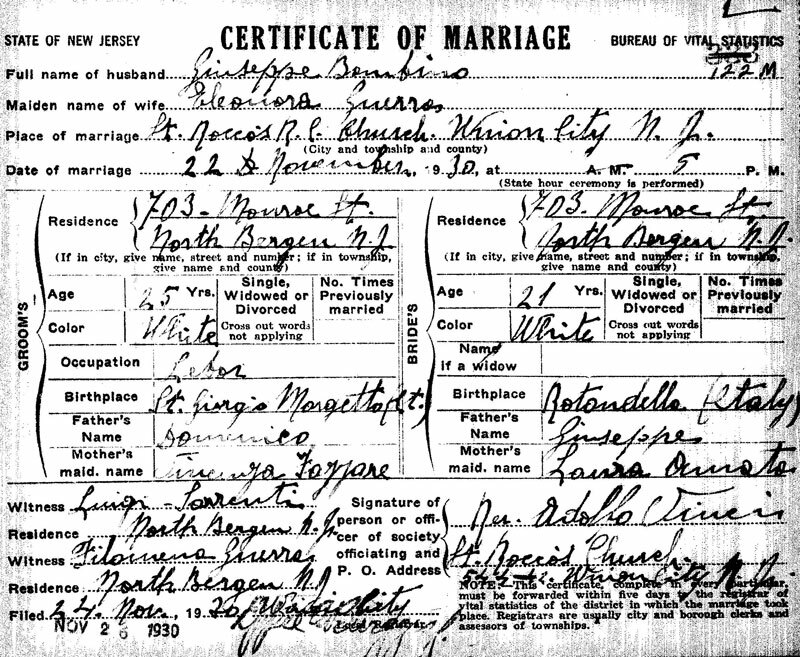 I’m certain Giuseppe made his way to Jersey by 1930 because I found the certificate of marriage for him and my great-grandmother, Eleonora Guerra. I’d like to think if the clerk who filled out the license had any idea that almost 90 years in the future I would be examining it with such attention, he or she would have written a little more neatly. But penmanship aside, the document provides a lot of good information. The marriage took place on November 22. It was barely a year after the Great Stock Market Crash of 1929, and 33 years before John F. Kennedy would be assassinated on the same day in 1963. They were married at St. Rocco’s Roman Catholic Church in Union City. They were a young couple by today’s standards. Giuseppe was 25, and Eleonora was 21. Another detail which signals this was a different time—the document lists the groom’s job as a laborer, but does not have a field for the bride’s occupation. Reading the certificate, I tried to picture Giuseppe as a younger man at his own wedding, rather than a bow-tied father of the bride. This would have been years before he was anybody’s “Papa” Joe. Borrowing the phrase my grandfather used when I first brought my future wife Leigh around, I imagined that Giuseppe was happy to have found a “nice Italian girl” to build a life with here in America. Both the bride and groom were born in Italy. Giuseppe came from San Giorgio Morgeto and Eleonora from Rotondella. 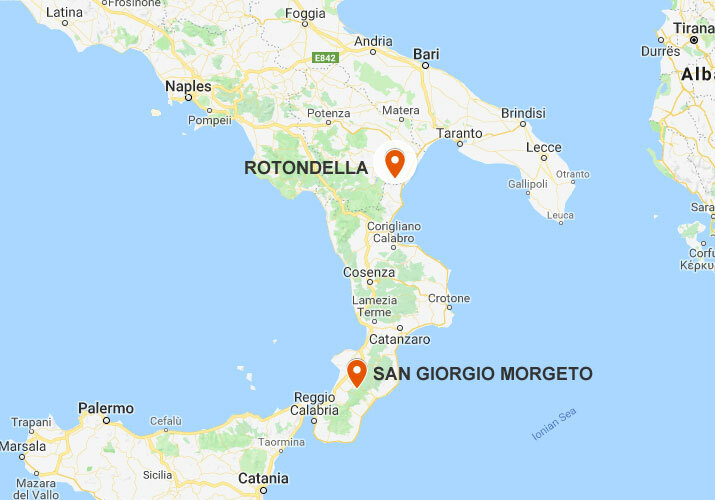 Admittedly, I know very little of Italian geography or podiatry, but when I look at the two locations on the map, I would say they are both in the foot area of the boot. I would say Rotondella is just above the back of the arch and San Giorgio is in somewhere near the toes. The certificate also revealed the names of Giuseppe and Eleonora’s parents. I had found the next entries for my family tree! Eleonora’s parents were Giuseppe Guerra and Laura D’Amato. And Giuseppe’s parents were Domenico Bombino and Vincenza Fazzari. I knew these names were my keys to the past. They would help me find other Bombino’s, Guerra’s, D’Amato’s, and Fazzari’s. And then. . . my research hit a bit of a wall. 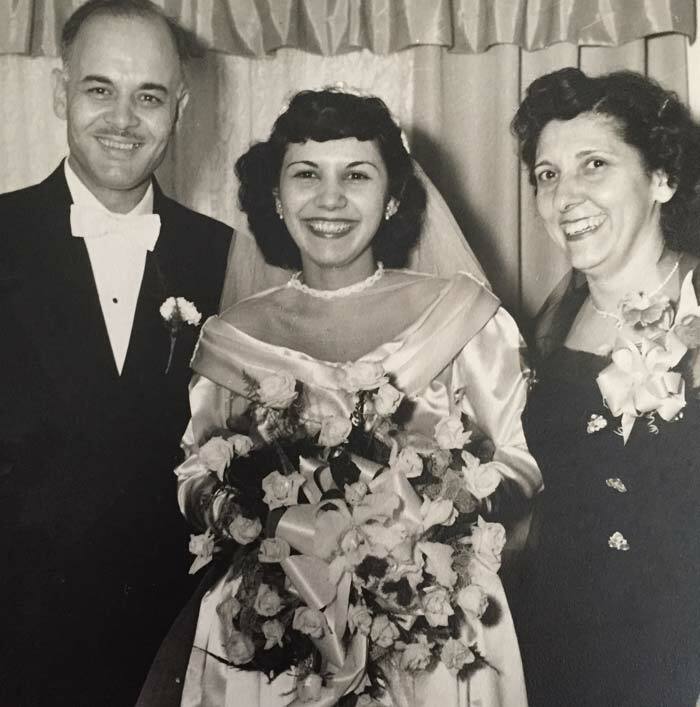 My great-great-grandparents’ names remained just that—names on my tree with no other details. I would look at them from time to time and wonder who these people were, what they looked like, and what their lives were like. Since I first became interested in my family history, I’ve been slowly filling out different branches of my tree. When I reach what seems like a wall on one line, I start on another. I was surprised to learn that some branches of my family stretch back several generations here in America (but that’s another story for another day). No one came over on the Mayflower or was a Native American, but they have been here for a while. It always seems easier to research those families than my Italian ancestors, who have only been stateside since the early part of last century. The prospect of navigating Italian records in Italian seems daunting to say the least. Or maybe the real reason my research stalled is that I don’t have close relatives still living who might drop the name of a person or place to spur on or corroborate my findings. There is no one to help me fill in the answers to the types of questions that facts on a marriage license can’t answer. How did the Giuseppes and Eleonoras of the past meet and what were they like? Did Giuseppe’s father Domenico have the same smile behind his eyes that his son did? Enter my DNA test results. A few weeks ago, when the Bombinos were about the furthest thing from my mind, I got an alert out of the blue that I had a new match on AncestryDNA from the test I had taken a few years prior. Name and photo blurred for privacy. 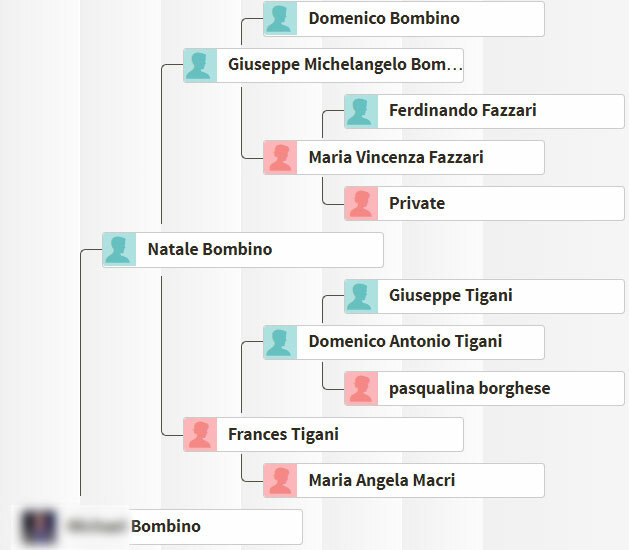 From his tree, I saw that he was none other than a great-grandson of the elusive Domenico Bombino. I immediately reached out and we began to message back and forth. He told me most of our Bombino cousins are living in Canada, but a lot are still living in the Calabria region of Italy. Eventually, I asked him if he had any pictures of Domenico. He said yes, and a few days later I was looking at my great-great-grandfather for the first time. The picture was a picture my cousin had taken of a framed photo in his aunt’s house. Although a bit blurry, Domenico comes through loud and clear. He seems to fill the frame and look directly out at me. 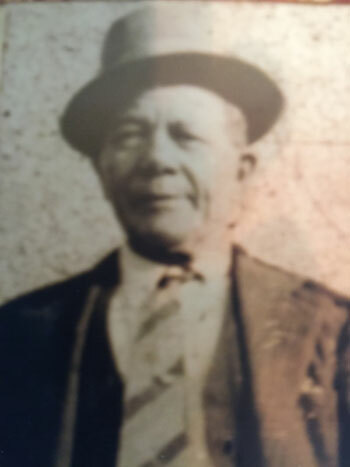 I would guess he is somewhere north of 60 in years and looks as if he dressed up in his jaunty hat, jacket, and wide tie just to get his picture taken. I see some similarities to his son Giuseppe. But there is someone else I think he looks a lot like too. Yes. You guessed it. . . yours truly. He seems to have the same stocky build as his handsome great-great-grandson and there is definitely a similarity in the shape of his face and features. It seems crazy that spitting into a tube a few years back and sending it off in the mail has brought me closer to a man who lived all of his life in Italy over a century ago, but that’s what makes DNA testing so valuable. If like me, you’ve hit a wall with your research or don’t even know what relatives you may have out there, I definitely recommend testing your DNA. In this case, the match was on AncestryDNA, but there are a number of different tests that are good for different purposes. You can read my guide to DNA testing here to learn about what’s out there and the pros and cons of each. Try it, and who knows? You might end up face to face with your great-great-grandfather. Nice story. Which one is best for ethnic ancestry? 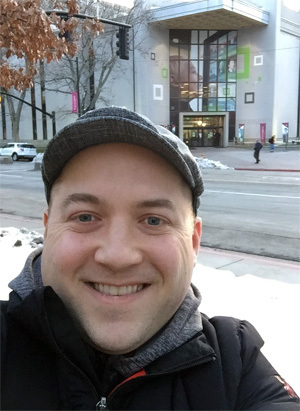 I have missing data on my family tree from Europe, and wonder about my ethnic background. To actually find relatives, doesn’t someone else need to use the same program to make a match?